You are responsible for yourself and your personal items on the river. You must be in good health and be physically fit. You should be in good mental condition and know your limitations. You should expect fun and relaxation, but know that there will be some challenges. You may need to assist in loading and unloading your vessel if on a flyfishing raft trip. and carry it over short distances. Because of the risks associated with any water sport, it is recommended that you be a competent swimmer. If you have any special medical conditions, consult your doctor before taking any trips and notify a SRRC staff member about your condition before participating. The basic rental fee for canoe and kayak rental includes: Personal Flotation Device (life jacket) and paddles. For flyfishing raft trips, we provide additional spare tackle, snacks and drinks. 1. Comfortable fishing attire. Shirts and shorts / pants of breathable fabric appropriate for summer months. Its is highly recommend you bring a rain jacket or warm shirt in a dry bag to carry on the river. The Smith River flows from the bottom of Philpott dam at 45 degrees and although it warms up as you move downstream, "natures AC" will chill you even in the heat of summer. 2. Old tennis shoes, water shoes, or sandals – NO FLIP FLOPS! 3. Sunscreen and a hat. 4. If you wear glasses, a retainer strap is recommended. 5. Towel and dry clothes for after the trip. 6. In cool weather, you should wear wool clothing and a windbreaker or a rain jacket. 7. Please do not bring along any jewelry or other valuables. 9. Valid Virginia Fishing License is required for all persons age 16 or older planning to fish. If you are a non-resident of Virginia, you are required to have a permit if you are 12 or older. 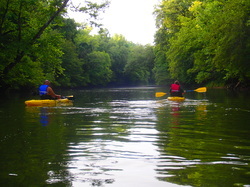 We have numerous services, float and wade trips, kayak and canoe rental just to name a few. It is our mission to get new people into the sport of fly fishing as well as show the seasoned veteran all the Smith River has to offer. The Smith has 31 miles of crystal clear water from Philpott Dam to Mitchel Bridge with ten access points. The fishing is mainly for wild Brown trout with an average of 800 fish per mile. The lower section also holds Rock Bass, and River Bream(Redbreast)﻿. Outdoor recreational activities have inherent risks, dangers, and hazards. Your participation in such activities, including use of Smith River Outfiiters services and equipment, may result in injury, illness, or death. Smith River Outfiiters assumes no responsibility for personal safety and/or loss of personal property. We ask that you read and sign a “release of liability form” before you make the trip. A parent or guardian must sign if participant is under the age of 18 . You participate at your own risk.